A super easy granola recipe that even your kids can help make right on the stove. 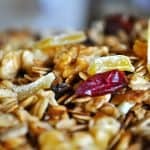 Finally homemade granola my kids will eat. Maybe they eat it because they helped make it or maybe they eat it because it’s just damn good granola. And with the 25-pound bag of oatmeal in my pantry, I can see a WHOLE lotta granola in our future. Kids can help make it! This little granola recipe really is super easy to whip up. My kids were happy to measure, stir, snip up dried mangos and taste test. It was a fun after dinner project and probably wouldn’t have been slightly burned if Agatha(the cat) hadn’t tried to eat the chicken living in our bathroom. True Story. Even then scorched granola made by children is still good granola. If you make it, be sure your bathroom living chicken is securely kept away from the cat, a peaceful living tip from me to you. The original recipe, found on Lick the Bowl Good, called for sunflower seeds, coconut and sesame seeds, I’m pretty sure I want to add them next time. I also think a healthy wallop of chocolate would be a delicious addition. This was munched and gobbled up by boys for our bedtime snack and will make a great addition to lunches this week. Keep the cat away from your bathroom chicken and your granola will be fine. Got it.